Celebrating 75 years of Powering Paradise, this exhibition will explore the history and continuing operation of Keys Energy Service (KEYS), the public power utility for the Lower Florida Keys. Headquartered in Key West, Florida, KEYS provides electricity from Key West to the Seven Mile Bridge and serves more than 28,000 customers. Islands, Imagination and Instance: Florida Keys Folk Art brings together paintings, sculptures, mosaics and wood carvings by folk artists working in the Florida Keys, both historic and contemporary. Variously termed folk, primitive, visionary, naïve, and outsider, these artists have played a significant role in our local community. Unlike academic or fine art, folk art typically derives from deeply-rooted community traditions, with master craftspeople developing a local style emulated by others and passed from one generation to the next. The flora and fauna (islands), the originality (imagination), and atmosphere (instance) of the Florida Keys have shaped the way in which they express themselves artistically. These are individuals that do not necessarily create art for financial gains; they do it because their artwork allows them to discover their true being. Their work represents the Florida Keys, and it tells the tale of tradition, of cultural identity; it is a part of everybody’s everyday experience. A folk artist may create highly personal images drawn from popular culture, memory, and the artist’s cultural or ethnic heritage. Whatever the method, folk art is valued for its beauty and expressive power, for dynamic linear forms, intense colors, the combination of decorative and utilitarian concerns, and the sense of familiarity it evokes by reflecting everyday life as well as the hopes and dreams of ordinary people. Folk artists included in this exhibition are Stanley Papio, Makiki, Ronny Bailey, Frank Balbontin, Mario Sanchez, Jack Baron and Papito Suarez. They said it couldn’t be done – an overseas train to Key West. Take a journey on the Florida East Coast Railway’s Key West Extension. Henry Flagler, the Standard Oil tycoon, spent over $30 million of his own money to build a railroad joining mainland Florida to Key West. While the tracks are forever gone, taken out by the most powerful hurricane to strike the United States, the rest became the right of way for the present-day Overseas Highway. Flagler’s Overseas to the Keys exhibition features the amazing stories behind this great American engineering feat. 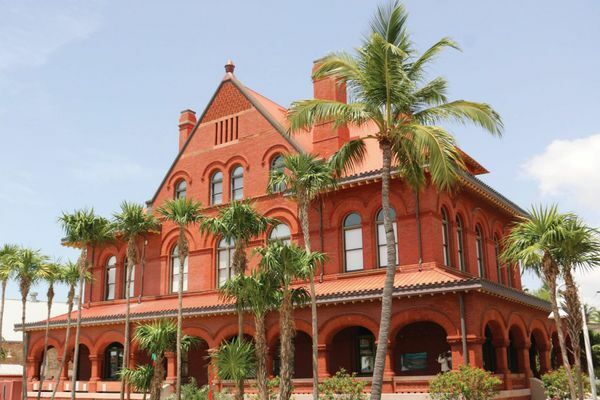 Through a mix of artifacts, film, and quotes from railroad workers and Key West townspeople, visitors learn how Flagler’s civil engineers invented new technologies to meet construction demands. More than 4,000 construction workers labored under conditions unfathomable by today’s standards. Pictures and stories of Flagler’s arrival at the Key West station on January 22, 1912, illustrate the revolutionary moment that changed the Florida Keys. The Society’s permanent collection, along with objects from the Bramson Collection, reinforce and challenge our understanding of how this hundred-year-old engineering marvel continues to impact the region. The exhibit features 59 original pen-and-ink drawings by internationally-renowned marine wildlife artist and conservationist, Guy Harvey. The sketches follow the narrative of Ernest Hemingway’s Pulitzer Prize winning novel, The Old Man and the Sea. Widely recognized today as one of the world’s finest marine wildlife artists, Guy Harvey combines his unique artistic talents with his background as a marine biologist, diver, photographer and angler, to create magnificent marine wildlife art. Guy’s artistic roots can be traced back to his childhood on the island of Jamaica, where he spent many hours fishing and diving. While attending a boarding school in England, Guy became captivated by Ernest Hemingway’s The Old Man and the Sea and subsequently began developing a series of sketches which are featured in this exhibition. His illustrations of the tale of Santiago’s epic battle with the marlin helped launch Guy Harvey’s career as an artist.